Use the form to buy your guidebooks online (via PayPal) – first choose your location then choose which guidebook(s) you want to buy. Please choose your region - the different prices help us cover postage costs. The address your guidebook(s) should be sent to. When you click the Buy Now button you will be taken to the PayPal website to make a secure payment. You don't need a Paypal account, you can pay by debit/credit card if you wish. Ours is a not-for-profit organisation and we don’t want to exclude anyone from accessing the pilgrimage because of financial constraints. The new guidebook which describes the pilgrimage between Brentor and Glastonbury in section 1, and the way between Glastonbury and Avebury in section 2, has been bound together in one volume in order to keep costs down. It is being sold for £7.95 (plus post and packing). It includes information about opportunities for wild camping along the way – which costs nothing! 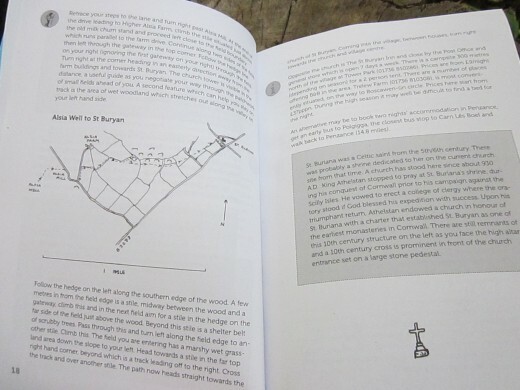 So buy the guidebook now and begin planning your own journey along Mary/Michael Pilgrims Way. As an alternative for UK residents, instead of purchasing the guidebooks via the website, you can send a cheque for £7.95 made payable to: Mary/Michael Pilgrims Way, 19 Ridgeway, Exeter EX4 5AR. Please remember to include an A4 size stamped addressed envelope, with £1.48 worth of stamps. A guide to the Cornwall part of the route is also available. As in the Brentor to Avebury guidebook, it has some detailed maps of potentially confusing parts of the route We have also included extracts from poems which seem relevant to particular locations, some written by poets with strong links to Cornwall. You can purchase this guidebook through the website or send a cheque for £5.95 to the above address. Postage and packing costs remain the same. For more details about the contents of the guidebooks look at the Route Page.